蔡建国, 王蜂岚, 冯健, 等. 2010 新广州站索拱结构屋盖体系连续倒塌分析. 建筑结构学报, 31(7): 103-109. 蔡建国, 王蜂岚, 冯健. 2010. 大跨空间结构抗连续性倒塌概念设计. 建筑结构学报, 31(S1): 283-287. 陈适才, 任爱珠, 王静峰, 陆新征. 2008. 钢筋混凝土楼板火灾反应数值计算模型. 工程力学, 25(3): 107-112. 陈适才, 陆新征, 任爱珠, 江见鲸. 2009. 基于纤维梁模型的火灾下多层混凝土框架非线性分析. 建筑结构学报, 30(6): 44-53. 傅学怡, 吴兵, 陈贤川, 等. 2008. 卡塔尔某超高层建筑结构设计研究综述. 建筑结构学报, 29(1): 1-9. 方召欣, 李惠强. 2007. 结构鲁棒性与风险防控. 工程力学, 24(Sup.I):79-82. 国家质量技术监督局, 中华人民共和国建设部. 2000. 砌体工程现场检测技术标准GB/T 50315-2000. 北京: 中国建筑工业出版社. 顾祥林, 印小晶, 林峰, 王英. 2010. 建筑结构倒塌过程模拟与防倒塌设计. 建筑结构学报, 31(6). 过镇海, 时旭东. 2003a. 钢筋混凝土的高温性能及其计算. 北京：清华大学出版社. 过镇海, 时旭东. 2003b. 钢筋混凝土原理和分析. 北京：清华大学出版社. 胡晓斌. 2007. 新型多面体空间刚接结构抗连续倒塌性能研究[博士学位论文]. 北京: 清华大学. 姜长生, 孙隆和, 吴庆宪, 等. 1998. 系统理论与鲁棒控制. 北京: 北京航空航天大学出版社. 江晓峰, 陈以一. 2008. 建筑结构连续性倒塌及其控制设计的研究现状. 土木工程学报, 41(6): 1-8. 柳承茂, 刘西拉. 2004. 结构安全性综合评估方法的研究. 四川建筑科学研究, 30(4): 46-48. 吕大刚, 崔双双, 李雁军, 王光远. 2010. 基于备用荷载路径Pushover方法的结构连续倒塌鲁棒性分析. 建筑结构学报, (S2):112-118. 林旭川, 陆新征, 缪志伟, 叶列平, 等. 2009. 基于分层壳单元的RC核心筒结构有限元分析和工程应用, 土木工程学报, 2009, 42(3): 51-56. 林旭川, 潘鹏, 叶列平, 陆新征, 赵世春. 2009. 汶川地震中典型RC框架的震害仿真与分析, 土木工程学报, 42(5): 13-20. 林旭川, 陆新征, 叶列平. 2010. 钢-混凝土混合框架结构多尺度分析及其建模方法, 计算力学学报, 27(3): 469-475. 陆新征, 卢啸, 李易. 2009. 结构连续倒塌及其工程对策. 防护工程, 31(4): 51-57. 陆新征, 林旭川, 叶列平, 等. 2010. 地震下高层建筑连续倒塌的数值模型研究. 工程力学, 27(11): 64-70. 陆新征, 叶列平, 缪志伟. 2009. 建筑抗震弹塑性分析. 北京: 中国建筑工业出版社. 梁益, 陆新征, 李 易, 叶列平, 江见鲸. 2010. 楼板对结构抗连续倒塌能力的影响, 四川建筑科学研究, 36(2): 5-10. 陆洲导, 朱伯龙, 姚亚雄. 1995. 钢筋混凝土框架火灾反应分析. 土木工程学报, 28(6)：18~27. 缪志伟, 陆新征, 李易, 等. 2008. 基于通用有限元程序和微平面模型分析复杂应力混凝土结构, 沈阳建筑大学学报(自然科学版), 24(1):49-53. 门俊, 陆新征, 宋二祥, 陈肇元. 2006. 分层壳模型在剪力墙结构计算中的应用, 防护工程, 28(3), 2006, 9-13. 秦从律，张爱晖. 2005. 基于截面纤维模型的弹塑性时程分析方法, 浙江大学学报(工学版), 39(7): 1003~1008. 邱德锋, 周艳, 刘西拉. 2005. 突发事故中结构易损性的研究. 四川建筑科学研究, 31(2): 55-59. 钱稼茹,胡晓斌. 2008. 多层钢框架连续倒塌动力效应分析. 地震工程与工程振动, 28(02):8-14. 齐宏拓, 李琪琳. 2010. 钢筋混凝土楼板抗连续倒塌性能数值模拟分析. 建筑结构, 40(S2): 358-364. 万墨林. 1990a. 大板结构抗连续倒塌问题(上). 建筑科学, 3(3):17-24. 万墨林. 1990b. 大板结构抗连续倒塌问题(下). 建筑科学, 16(4):10-20. 汪训流, 陆新征, 叶列平. 2007. 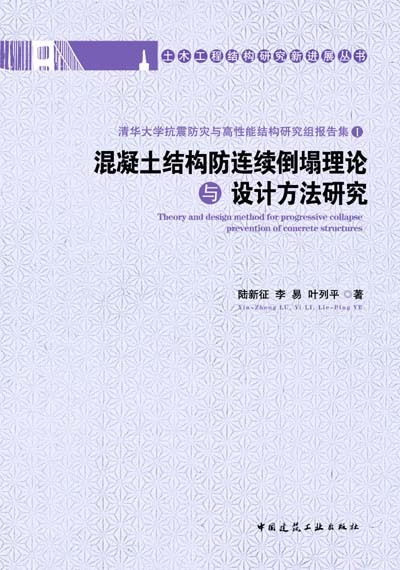 往复荷载下钢筋混凝土柱受力性能的数值模拟, 工程力学, 2007, 24(12): 76-81. 叶列平, 陆新征, 马千里, 等. 2006. 混凝土结构抗震非线性分析模型、方法及算例. 工程力学, 23(sup. II): 131-140. 易伟建, 何庆峰, 肖岩. 2007. 钢筋混凝土框架结构抗倒塌性能的试验研究. 建筑结构学报, 28(5): 104-109. 朱炳寅, 胡北, 胡纯炀. 2007. 莫斯科中国贸易中心工程防止结构连续倒塌设计. 建筑结构, 37(12): 6-9. 张富文, 吕西林. 2009. 框架结构不同倒塌模式的数值模拟与分析. 建筑结构学报, 30(5). 张凡榛, 易伟建. 2010. 无梁楼板的抗倒塌性能试验研究及分析. 湖南大学学报(自然科学版), 37(4): 1-5. 赵广坡, 肖克艰, 冯远, 陈志强; 熊耀清, 罗昱. 2010. 成都双流国际机场T2航站楼大厅陆侧大跨钢结构抗连续倒塌分析. 建筑结构, 40(9): 27-30. 中华人民共和国建设部. 2001a. 建筑结构荷载规范GB50009-2001. 北京: 中国建筑工业出版社. 中华人民共和国建设部. 2001b. GB50011-2001. 建筑抗震设计规范. 北京: 中国建筑工业出版社. 中华人民共和国建设部. 2002. 混凝土结构设计规范GB50010-2002. 北京: 中国建筑工业出版社. 中华人民共和国建设部. 2006.建筑设计防火规范GB50016-2006. 北京: 中国计划出版社, 2006. 中华人民共和国住房与城乡建设部. 2008. 工程结构可靠性设计统一标准GB50153-2008. 北京: 中国建筑工业出版社. 中华人民共和国住房与城乡建设部. 2010a. 高层建筑混凝土结构技术规程JGJ3-2010. 北京: 中国建筑工业出版社. 中华人民共和国住房与城乡建设部. 2010b. 混凝土结构设计规范GB50010-2010. 北京: 中国建筑工业出版社. 周健, 陈素文, 苏骏, 等. 2010. 虹桥综合交通枢纽结构连续倒塌分析研究. 建筑结构学报, 31(5): 174-180. 张雷明, 刘西拉. 2003. 钢筋混凝土结构倒塌分析的前沿研究. 地震工程与工程振动, 23(3): 47-52. 张雷明, 刘西拉. 2007. 框架结构能量流网络及其初步应用. 土木工程学报, 40(3): 45-49. 朱明程, 刘西拉. 1994. 多层砖混建筑的连续倒塌分析. 四川建筑科学研究，20(2): 2-5. 朱幼麟. 1988. 大板结构连续倒塌问题的探讨. 建筑技术, 13(2):49-51. Abruzzo J, Matta A, Panariello G. 2006. Study of mitigation strategies for progressive collapse of a reinforced concrete commercial building. Journal of Performance of Constructed Facilities, 20(4): 384-390. ACI. 2008. ACI 318m-08. Building code requirements for structural concreteand commentary. Farmington Hills: American Concrete Institute. Agarwal J, Blockley D, Woodman N. 2003. Vulnerability of structural systems. Structural Safety, 25(3): 263-286. ASCE. 2005. ASCE-7. Minimum design loads for buildings and other structures. Reston: American Society of Civil Engineers. ASTM. 1985. Standard method of fire tests of building construction and materials. Philadelphia: American Society for Testing and Material. Astaneh-Asl A. 2003. Progressive prevention in new and existing buildings. // Nazmy, Aly S., Biddah, Ashraf M., El-Sawy, Khaled M, eds. Proceedings of the 9th Arab Structural Engineering Conference, Abu Dhabi: UAE University Publication, 1001-1008. Bailey C. 2002. Holistic behavior of concrete buildings in fire. Structures and Buildings, 151(3):199-212. Baker J W, Schubert M, Faber M H. 2008. On the assessment of robustness. Structural Safety, 30(3): 253-267. Bao Y, Kunnath S K, El-Tawil S, Lew H S. 2008. Macromodel-based simulation of progressive collapse: RC frame structures. Journal of Structural Engineering, ASCE, 134(7): 1079-1091. Bazant Z P, Caner F C, Carol I, Adley M D, Akers S A. 2000. Microplane model M4 for concrete. I: formulation with work-conjugate deviatoric stress. Journal of Engineering Mechanics, ASCE, 126(9): 944~953. Beeby A W. 1999. Safety of structures, and a new approach to robustness. The Structural Engineer, IStructE, 77(4): 16-21. Bignell V, Peters J, Pym C. 1977. Catastrophic failures. New York: Milton Keynes & Open University Press. Breen J. 1980. Developing structural integrity in bearing wall buildings. PCI Journal, 25(1): 42-73. BSI. 2002. BS8110. Structural use of concrete, Part 1: Code of practice for design and construction. London: British Standard Institute. Building Research Division Team. 1970. Guide criteria for the evaluation of operation breakthrough housing system. Springfield: National Technical Information Service. Burnett E F P. 1975. The avoidance of progressive collapse: regulatory approaches to the problem. Washington, D.C: National Bureau of Standards. Buscemi N, Marjanishvili S. 2005. SDOF Model for Progressive Collapse Analysis. // Proceedings of the 2005 Structures Congress and the 2005 Forensic Engineering Symposium, Metropolis & Beyond. Byfield M P. 2006. Behavior and design of commercial multistory buildings subjected to blast. Journal of Performance of Constructed Facilities, 20(4): 324-329. Caneva K L. 1993. Robert mayer and the conservation of energy. Princeton, NJ: Princeton University Press. Carino N, Lew H S. 2001. Summary of NIST/GSA workshop on application of seismic rehabilitation technologies to mitigate blast-induced progressive collapse. Gaithersburg: National Institute of Standards and Technology. CEN. 2004a. EN 1992-1-1. Eurocode 2: Design of concrete structures. Part 1: General rules and rules for buildings. Brussels: European Committee for Standardization. CEN. 2004b. EN 1992-1-2. Eurocode 2: Design of concrete structures. Part 1-2: General rules - Structural fire design. Brussels: European Committee for Standardization. CEN. 2006. EN 1991-1-7. Eurocode 1: Actions on structures. Part 1-7: General Actions - Accidental actions. Brussels: European Committee for Standardization. Corley W G, Sosen M A, Thornton C H, et al. 1996. The Oklahoma city bombing: improving building performance through multi-hazard mitigation (FEMA 277). Washington, D.C.: FEMA/ASCE. Corley W G, Mlakar Sr. P F, Sozen M A, et al. 1998. The Oklahoma city bombing: summary and recommendations for multihazard mitigation. Journal of Performance of Constructed Facilities, 12(3): 100-112. Corley W G. 2002. Applicability of seismic design in mitigating progressive collapse. Proceeding of Workshop on Prevention of Progressive Collapse, Washington D.C: National Institute of Building Sciences. Crowder B, Stevens D J, Marchand K A. 2004. Design of buildings to resist progressive collapse. // Virginia Society of Professional Engineers Tidewater Chapter & DoD Security Engineering Working Group, Short course proceedings of Security Engineering Workshop. D'Ambrisi A, Filippou F. 1999. Modeling of cyclic shear behavior in RC members. Journal of Structural Engineering, ASCE, 1999, 125(10): 1143~1149. DoD. 2005. DoD2005. Design of structures to resist progressive collapse. Washington, D.C: Department of Defense. DoD. 2008. UFC3-340-02. Structures to resist the effects of accidental explosions. Washington, D.C: Department of Defense. DoD. 2009. DoD2009. Design of structures to resist progressive collapse. Washington, D.C: Department of Defense. DoD. 2010. DoD2010. Design of structures to resist progressive collapse. Washington, D.C: Department of Defense. Dusenberry D O. 2002. Review of existing guidelines and provisions related to progressive collapse.// Proceedings of Workshop on Prevention of Progressive Collapse, Washington, D.C: National Institute of Building Sciences. Dusenberry D O, Hamburger R O. 2006. Practical means for energy-based analyses of disproportionate collapse potential. Journal of Performance of Constructed Facilities, 20(4): 336-348. Dwaikat M D, Kodur V K R. 2009. Hydrothermal model for predicting fire-induced spalling in concrete structural systems. Fire Safety Journal. 44(3):425-434. Ellingwood B, Leyendecker E. 1978. Approaches for design against progressive collapse. Journal of the Structural Division, 104(3): 413-423. Ellingwood B R. 2005. Strategies for mitigating risk of progressive collapse. New York: Proceeding of ASCE/SEI Structures Conference. Ellingwood B R. 2006. Mitigating risk from abnormal loads and progressive collapse. Journal of Performance of Constructed Facilities, 20(4):315-323. El-Rimawi J, Burgess I, Plank R. 1993. Modelling the behaviour of steel frames and subframes with semi-rigid connections in fire.// Twilt L: Proceedings of the Third CIB/W14 Workshop on Fire Modelling, TNO, Rijswijk, The Netherlands, 152-168. Esmaeily A, Xiao Y. 2005. Behavior of reinforced concrete columns under variable axial loads: analysis. ACI Structural Journal, 102(5): 736-744. Federal Emergency Management Agency (FEMA). 2003. Primer for design of commercial buildings to mitigate terrorist attacks (FEMA-427). Washington D C: Federal Emergency Management Agency. Fu F. 2009. Progressive collapse analysis of high-rise building with 3-D finite element modeling method. Journal of Constructional Steel Research, 65(6): 1269-1278. Fuller G R. 1975. Industrialized concrete construction for hud. ACI- Special Publication 48: 7-34. Gawin D, Pesavento F, Schrefler B A. 2006 Towards prediction of the thermal spalling risk througha multi-phase porous media model of concrete. Computer Methods in Applied Mechanics and Engineering. 195(41-43): 5707-5729. Grierson D E, Safi M, Xu L, et al. 2005. Simplified Methods for Progressive-Collapse Analysis of Buildings.// Proceedings of the 2005 Structures Congress and the 2005 Forensic Engineering Symposium, Metropolis & Beyond. Griffiths H, Pugsley A, Saunders O. 1968. Report of the inquiry into the collapse of flats at Ronan Point, canning town. London: Her Majesty's Stationary Office. GSA. 2003. GSA2003. Progressive collapse analysis and design guidelines for new federal office buildings and major modernization projects. Washington, D.C: United States General Services Administration. Hamburger R, Whittaker A. 2003. Design of steel structures for blast-related progressive collapse resistance. Washington, DC: American Society of Civil Engineers. Hansen E, Wong F, Lawver D, et al. 2005. Development of an analytical database to support a fast running progressive collapse assessment tool. // Proceeding of ASCE/SEI. Hashemi A, Mosalam K M. 2007. Seismic evaluation of reinforced concrete buildings including effects of masonry infill walls. PEER Technical Report 2007/100. University Of California, Berkeley. Hayes Jr. J R, Woodson S C, Pekelnicky R G, et al. 2005. Can Strengthening for Earthquake Improve Blast and Progressive Collapse Resistance? Journal of Structural Engineering. ASCE, 131(8): 1157-1177. Hinman E E, Hammond D. 1997. Lessons from the Oklahoma city bombing: defensive design techniques. New York: ASCE. Hinton.E, Owen D R J. 1984. Finite element software for plates and shells. Swansea: Pineridge Press. HMSO. 1976. Statutory Instrument 1976, No. 1676: Building and Buildings, London: Her Majesty's Stationery Office. Hognestad E. 1952. Inelastic behaviour in tests of eccentrically loaded short reinforced concrete columns. ACI Journal. 49(10): 117-139. Houghton D, Karns J. 2001. Effective mitigation of progressive collapse in steel frame buildings using ductile high-capacity girder-to-column moment connections exhibiting discrete structural continuity across a failed column. // Lindbergh & Associates. Proceedings of National Symposium on Comprehensive Force Protection. Charleston: Society of American Military Engineers (SAME). Hong C, Liew, R J Y. 2005. Explosion and fire analysis of steel frames using mixed element method. Journal of Engineering Mechanics ASCE, 131(6):606-616. Huang Z H, Burges I W, Plank R J. 1999. Nonlinear analysis of reinforced concrete slabs subjected to fire. ACI Structural Journal, 96(1):127~135. Huang Z H, Burgess I W, Plank R J. 2009. Three-Dimensional Analysis of Reinforced Concrete Beam-Column Structures in Fire. Journal of Structural Engineering, ASCE, 135(10): 1201-1212. Izzuddin BA, Vlassis AG, Elghazouli AY, et al. 2008. Progressive collapse of multi-storey buildings due to sudden column loss-Part I: Simplified assessment framework. Engineering Structures, 30(5):1308-1318. Jiang. J, Mirza. 1997. Nonlinear analysis of reinforced concrete slabs by discrete finite element approach. Computers & structures, 65(4):585-592. Kaewkulchai G, Williamson E. 2002. Dynamic progressive collapse of frame structure. // Andrew Smyth, eds. Proceeding of 15th ASCE Engineering Mechanics Conference. New York: Columbia University. Kaewkulchai G, Williamson E B. 2006. Modeling the impact of failed members for progressive collapse analysis of frame structures. Journal of Performance of Constructed Facilities, ASCE, 20(4): 375-383. Karns J E, Houghton D L. 2003. Macro and micro nonlinear analysis methods to assess progressive collapse potential in high-rise steel frame buildings as a function of beam-to-column connection behavior. // Proceedings of the 74th Shock & Vibration Symposium. San Diego, Paper U-031. Khandelwal K, El-Tawil S. 2007. Collapse behavior of steel special moment resisting frame connections. Journal of Structural Engineering, ASCE, 133(5): 646-655. Khandelwal K. 2008a. Multi-scale computational simulation of progressive collapse of steel frames. Michigan: University of Michigan. Khandelwal K, El-Tawil S. 2008b. Assessment of progressive collapse residual capacity using pushdown analysis. //Vancouver: Anderson D, Ventura C, Harvey D, Hoit M: Proceedings of the 2008 Structures Congress, ASCE. Khandelwal K, Kunnath S K, El-Tawil S, et al. 2008c. Macromodel-based simulation of progressive collapse: Steel frame structures. Journal of Structural Engineering, ASCE, 134(7): 1070-1078. Khandelwal K, El-Tawila S, Sadek F. 2009. Progressive collapse analysis of seismically designed steel braced frames. Journal of Constructional Steel Research, 65(3): 699-708. Kim J, An D. 2009. Evaluation of progressive collapse potential of steel moment frames considering catenary action. The Structural Design of Tall and Special Buildings, 18(4): 455-465. Kim H S, Kim J, An D W. 2009. Development of integrated system for progressive collapse analysis of building structures considering dynamic effects. Advances in Engineering Software, 40(1): 1-8. Kodur V K R. 2000. Spalling in high strength concrete exposed to fire-concerns, causes, critical parameters and cures. ASCE Structures Congress Proceedings, Philadelphia: 1-8. Kodur V K R, Wang T, Cheng F. 2004. Predicting the fire resistance behavior of high strength concrete columns. Cement & Concrete Composites, 26(2):141-153. Krauthammer T. 2003. AISC research on structural steel to resist blast and progressive collapse. Chicago: American Institute of Steel Construction. Lee C H, Kim S, Han K H, et al. 2009. Simplified nonlinear progressive collapse analysis of welded steel moment frames. Journal of Constructional Steel Research, 65(5): 1130-1137. Levy M, Salvadori M. 1992. Why buildings fall down. New York: Norton. Leyendecker E V, Ellingwood B R. 1977. Design Methods for Reducing the Risk of Progressive Collapse in Buildings. Washington, D.C: National Bureau of Standards. Lie T T, Irwin R J. 1993. Method to calculate the fire resistance of reinforced concrete columns with rectangular cross section. ACI Structural Journal, 90(1):52-60. Lim L, Wade C. 2002. Experimental fire tests of two-way concrete slabs. Fire Engineering Research Report 02/12. University of Canterbury and BRANZ Ltd, New Zealand. Lind N C. 1995. A measure of vulnerability and damage tolerance. Reliability Engineering and System Saftey, 48(1): 1- 6. Liu R, Davison B, Tyas A. 2005. A study of progressive collapse in multistory steel frames. Metropolis & beyond: Proceeding of ASCE/SEI Structures Conference, New York. Luccioni B M, Ambrosini R D, Danesi R F. 2004. Analysis of building collapse under blast loads. Engineering Structures, 26(1): 63-71. Lu X Z, Lin X C, Ma Y h, et al. 2008. Numerical simulation for the progressive collapse of concrete building due to earthquake. Proceedings of the 14th World Conference on Earthquake Engineering, October 12-17, Beijing, China, CDROM. Marchand K, Alfawakhiri F. 2005. Facts for steel buildings: Blast and progressive collapse. Chicago: American Institute of Steel Construction. Marjanishvili S M. 2004. Progressive analysis procedure for progressive collapse. Journal of Performance of Constructed Facilities, 18(2): 79-85. Marjanishvili S M, Agnew E. 2006. Comparison of various procedures for progressive collapse analysis. Journal of Performance of Constructed Facilities, ASCE, 20(4): 365-374. Matthews T, Elwood K J, Hwang S J. 2007. Explosive testing to evaluate dynamic amplification during gravity load redistribution for reinforced concrete frames. // Wallace J W, eds. Proceedings of Sessions of the 2007 Structures Congress, Long Beach. McGuire W. 1974. Prevention of Progressive Collapse.// Lee S L, Karasudhi P. eds. Proceedings of the Regional Conference on Tall Buildings, Bangkok: Asian Institute of Technology. Mitchell D, Cook W D. 1984. Preventing progressive collapse of slab structures. Journal of Structural Engineering, 110(7):1513-1532. Mohamad J T. 1998. Numerical modeling of the behavior of concrete structures in fire. ACI Structural Journal, 95(2): 183-193. Moore D B. 2002. The UK and European regulations for accidental actions. Proceedings of Workshop on Prevention of Progressive Collapse, Washington, D.C.: National Institute of Building Sciences. Msaad Y. 2007. Comparison between hydraulic and thermal spalling in heated concrete based on numerical modeling. Journal of Engineering Mechanics, ASCE. 133(6):608-615. MSC.Software Corporation. 2007. User Documentation Volume A: Theory and User Information. Los Angeles: MSC.Software Corporation. Munjiza A, Bangash T, John N W M. 2004. The combined finite-discrete element method for structural failure and collapse. Engineering Fracture Mechanics, 71(4):469-483. Munoz-Garcia E, Davison E, Tyas A. 2005. Structural integrity of steel connections subjected to rapid rates of loading. // Proceeding of ASCE/SEI Structures Conference, New York. Nafday A M. 2008. System safety performance metrics for skeletal structures. Journal of Structure Engineering, 134(3): 499-504. Nair R S. 2006. Preventing disproportionate collapse. Journal of Performance of Constructed Facilities. 20(4): 309-314. Newland D E, Cebon D. 2002. Could the World Trade Center have been modified to prevent its collapse? Journal of Engineering Mechanics, ASCE, 128(7): 795-800. NIST. 2005. Final report on the collapse of the world trade center towers. Gaithersburg: National Institute of Standards and Technology. NIST. 2008. Best practices for reducing the potential for progressive collapse in buildings. Gaithersburg: National Institute of Standards and Technology. ODPM. 2004. The building regulations 2000, Part A, Schedule 1: A3, Disproportionate collapse. London: Office of the Deputy Prime Minister. Omika Y, Fukuzawa E, Koshika N, et al. 2005. Structural responses of world trade center under aircraft attacks. Journal of Structural Engineering. ASCE, 131(1): 6-15. Osama A. Mohamed. 2006. Progressive collapse of structures annotated bibliography and comparison of codes and standards. Journal of Performance of Constructed Facilities, ASCE, 20(4):418-425. Pearson C, Delatte N. 2005. Ronan Point apartment tower collapse and its effect on building codes. Journal of Performance of Constructed Facilities, 19(2):172-177. Pekau O A, Cui Y. 2006. Progressive collapse simulation of precast panel shear walls during earthquakes. Computers and Structures, 84(5-6):400-412. PKPM工程部. 2006. SATWE用户手册及技术条件. 北京: 中国建筑科学研究院. Powell G. 2005. Progressive collapse case studies using nonlinear analysis. Metropolis & beyond: Proceeding of ASCE/SEI Structures Conference, New York. Princehorn M, Laefer D. 2005. Cost-effective decision making for blast mitigation. // Proceeding of ASCE/SEI Structures Conference, New York. Pujol S, Smith-Pardo J P. 2009. A new perspective on the effects of abrupt column removal. Engineering Structures, 31(4):869-874. Purkiss J A. 2007. Fire safety engineering design of structures(Second Edition). Amsterdam: Elsevier Ltd.
Ruth P, Marchand S M, Williamson E B. 2006. Static equivalency in progressive collapse alternate path analysis: reducing conservatism while retaining structural integrity. Journal of Performance of Constructed Facilities, ASCE, 20(4): 349-364. Sadek F; El-Tawil S, Lew H S. 2008. Robustness of Composite Floor Systems with Shear Connections: Modeling, Simulation, and Evaluation. Journal of Structural Engineering, ASCE, 134(11): 1717-1725. Sasani M, Bazan M, Sagiroglu S. 2007a. Experimental and analytical progressive collapse evaluation of actual reinforced concrete structure. ACI Structural Journal. 104(6): 731-739. Sasani M, Kropelnicki J. 2007b. Progressive collapse analysis of an RC structure. The Structural Design of Tall and Special Buildings, 17(4): 757-771. Sasani M. 2008a. Response of a reinforced concrete infilled-frame structure to removal of two adjacent columns. Engineering Structures, 30(9): 2478-2491. Structural Journal, 2008, 105(1): 96-103. Sozen M A, Thornton C H, Corley W G, et al. 1998. The Oklahoma city bombing: structure and mechanisms on the Murrah building. Journal of Performance of Constructed Facilities, 12(3):120-136. Spacone E, Filippou F, Taucer F. 1996. Fiber beam-column modeling for non-linear analysis of R/C frames. Journal of Earthquake Engineering and Structural Dynamics, 1996, 25(7): 711~725. Starossek. U. 2007. Typology of Progressive Collapse. Engineering Structures, 29(9):2302-2307. Talaat M, Mosalam K M. 2007. Towards Modeling Progressive Collapse in Reinforced Concrete Buildings.// Lyons R, Wallance J W, Eric Stovner. eds. Proceedings of the 2007 Structures Congress, Long Beach: Structural Engineering Institute (SEI) of ASCE. Usmani A S, Chung Y C, Torero J L. 2003. How did the WTC towers collapse: a new theory. Fire Safety Journal, 38(6): 501-533. Vlassis AG, Izzuddin BA, Elghazouli AY et al. 2008. Progressive collapse of multi-storey buildings due to sudden column loss-Part II: Application, 30(5):1424-1438. Wearne P. 2000. Collapse: when buildings fall down. New York: TV Books. Williams-Leir G. 1983 Creep of structural steel in fire: analytical expressions. Fire and Material, 7(2): 73-78. Yi W J, He Q F, Xiao Y, et al. 2008. Experimental study on progressive collapse resistant behavior of reinforced concrete frame structures. ACI Structural Journal. 2008, 105(4): 433-439. Zareian F, Krawinkler H. 2007. Assessment of probability of collapse and design for collapse safety. Earthquake Engineering and Structural Dynamics, 36(13): 1901-1914. Zhou Q, Yu T. 2004. Use of high-efficiency energy absorbing device to arrest progressive collapse of tall building. Journal of Engineering Mechanics, ASCE, 130(10): 1177-1187.